At the prefab zero energy home, plumbing continues. Faucets are installed, plumbing for the tub is laid out, vanities placed, and next is the pressure test, which, if it is fine....we will be able to turn on the WATER! I can not *wait* to sink into a hot shower not from water boiled on the wood cook stove (then precariously poured into the flimsy camping solar shower to heft up above the tub, hoping the tube won't disengage as the water eeks out, at times a spray, at times a drip...). And thank goodness, thank goodness, thank goodness, the seed I strew atop our recently graded, valuable soil is beginning to germinate. You can't really see it in pictures yet, the grass is just sprouting; but thank goodness for the gentle rains that fortuitously traversed Virginia in this dry season. 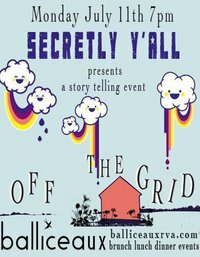 Speaking of off grid homes, there's a neat story telling event in Richmond coming up called, "Secretly, Y'all... Off The Grid." You're supposed to tell a story about an off grid experience and my friend, who is organizing it, thought I'd have something to add. This is where I admit... I'm no storyteller. What would I say? I don't think I'll do it. I mean, the first rule states, "...five to seven minute true tale (no fiction, no monologues, stand up, poetry etc.) with a clear beginning, middle and end." You lost me at "clear beginning, middle and end" honeychiles, not to mention the FIVE TO SEVEN minutes. Y'all know I tend to ramble! 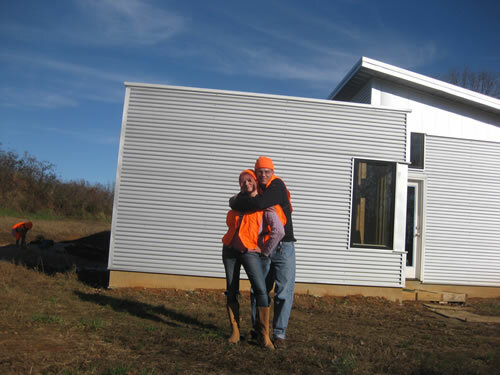 Off grid is more than a beloved, energy efficient, zero energy passive solar prefab home. 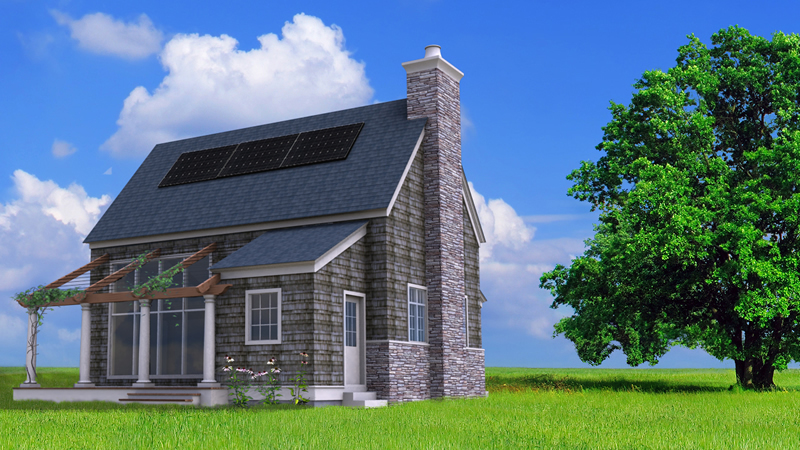 Off grid can be as impersonal as any McMansion suburbia, just with different technology. For many in the world, on grid still hasn't arrived, and for many in rural Virginia, we can still remember when "electricity came to town." Off grid can be unnoticeable - save for a solar panel, it might not occur to guests that all the running water and electricity are provided by the sun and rain. 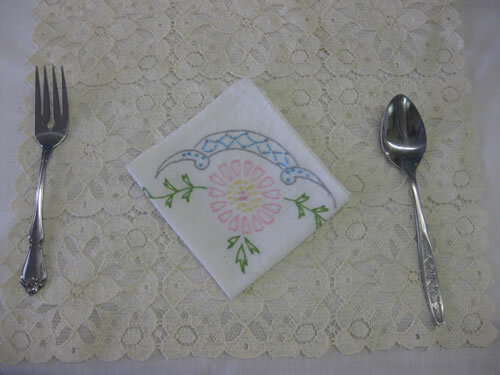 From our prefab cottage line, www.GreenCottageKits.com. Our own project, built pay-as-you-go, was not that way. Immediately, we were off grid. 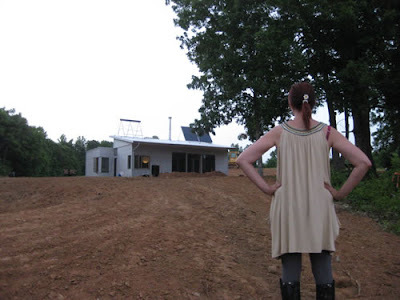 Every home is off grid in its first days of construction, we just stayed that way. Much later came electricity, now finally, plumbing. 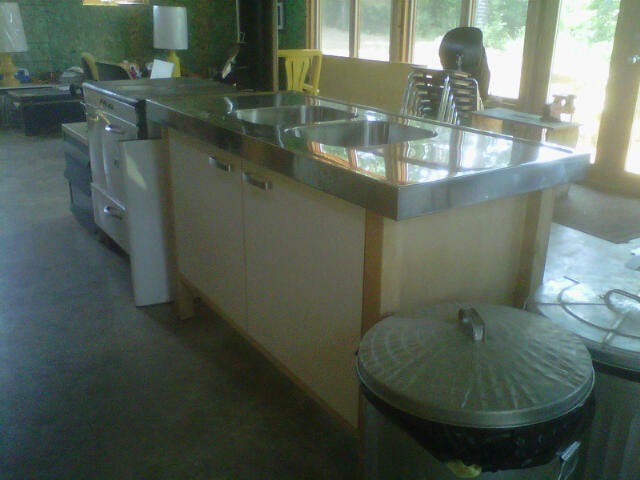 Next: Close up all the walls and get cookin' on modern interior design. 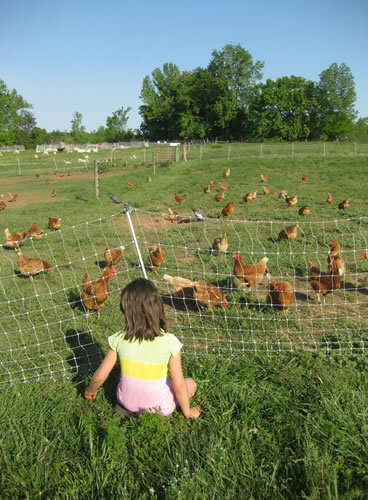 For ourselves, off grid living is also about enriching soil with compost, no-till fields, counting water as precious, backyard hens scratching freely and learning to enjoy the slightly-longers rather than the time-savers. The time we dropped our kids down the underground rainwater cistern? the solar shower... Oh, the solar shower. Until plumbing arrives, I use a solar shower. You know, those camping bags you fill with water and hope it doesn't run out? Later taking that solar shower indoors to hang over the clawfoot tub, heating water on the wood stove, until we can get the plumbing to work... and yes, off grid doesn't have to mean dire: plumbing, heat, electricity are all easily attained, thoughtfully, when off grid. 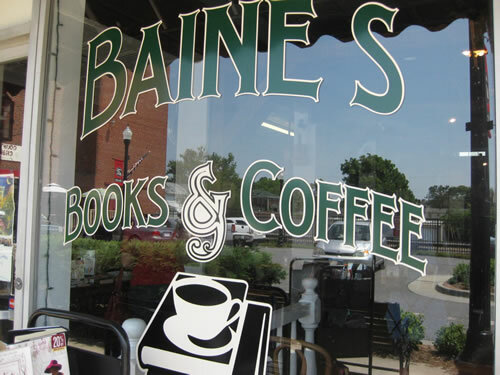 how when Pipsqueak 1 drives me crazy with too much energy I order, "Go grind me some coffee." It takes a lot longer than you think. One of my favorite off grid tools is the broadcast seed spreader. We're just programmed to think we need BIG IMPLEMENTS when it comes to farming. Off Grid Amish: Everyone is talking like Off Grid is some newfangled idea. Our Amish neighbors wouldn't ever consider being on grid... Mrs. Esh and I like to compare notes on what our families do. but often, in mid-afternoon, cooling means: LIME BEER. And pump-spray hairspray cans refilled with water, cooling in a fridge or stream to mist oneself on an especially hot day. 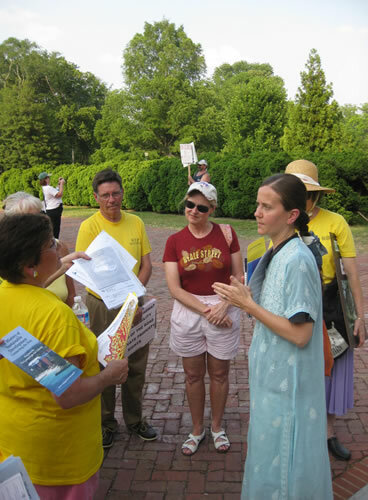 Cooling for many Virginians means, "Get thee to water." Isn't that what summer is all about? 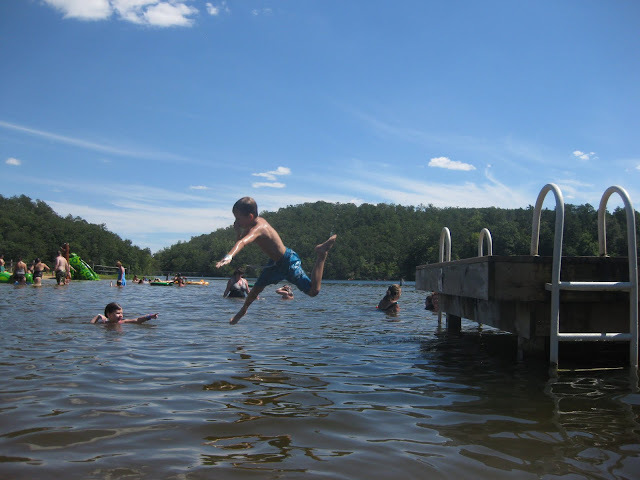 With Holliday Lake just down the road, if the mid-afternoon heat wilts you, head for the hills and the 150 acre lake until evening arrives to cool things down. IF I were to tell a tale... what would you want to hear? Our children were gone this weekend. 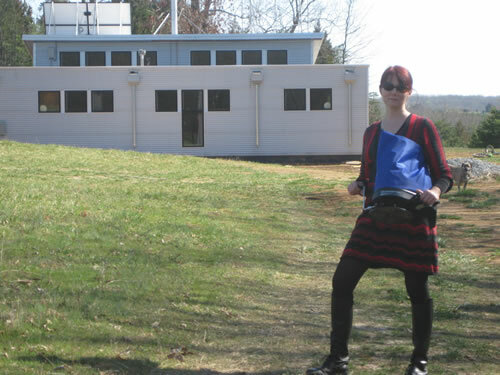 You might assume we kicked back in the modern prefab home, and rested. On the way from dropping them off at 4-H, we discovered this swing, next to a creek, deep in the woods, along the park roadside in the middle of *nowhere. * Lovely! 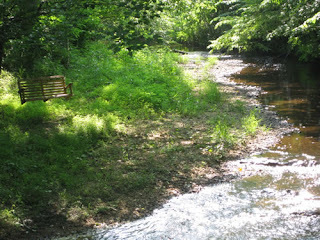 But there was no time to sit and rest, even on a charming unexpected bench in the middle of the woods. 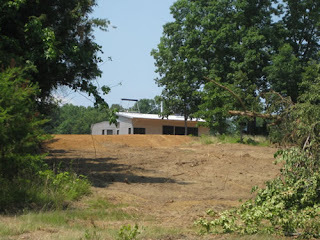 We had work to do to continue our progress on the prefab house kit! 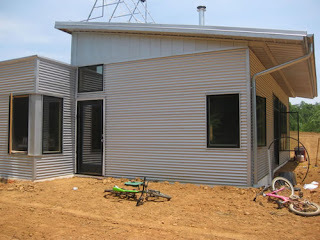 The children may have been whoopin' it up at 4-H Camp, but that meant we worked even *more* on the zero energy prefab home! Plumbing continued with Max, with Handsome Husband assisting, and we did a seasonal emptying of an off grid system: the composting toilet. Then I spread not straw but moldy hay over the recent excavation / grading. 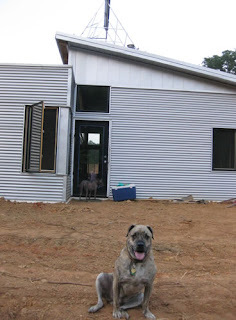 It was nice to see the energy efficient passive solar home performing nicely in the heat. The overhang kept direct sun out, yet there was always plenty of light inside. With the windows open overnight, at 7:30 a.m. it was 74 degrees as I closed the house back up. At 12, it was 79. Today the high was in the mid-90s. 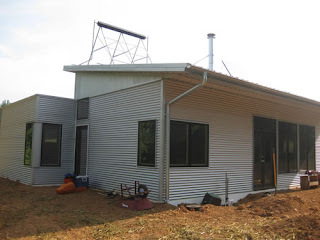 So, like in winter where we lose a degree an hour, this is consistent where we gain a degree an hour in summer, without any cooling systems, and always are about 15-20 degrees on the better side of the weather, still without systems and with just the passive solar design. By the way: After my last post y'all thought I was going to go off and join the Tea Party, didn't you. The Tea Party? Yo, they're France! Don't get me wrong. 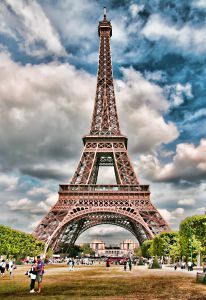 I love France! Well, here's the (latest) on France. They have banned all on-air references to Facebook and Twitter because eet does not eeexeest in zer original French lan-guage, and is 'clandestine advertising' zut alors and honeychiles, y'all. 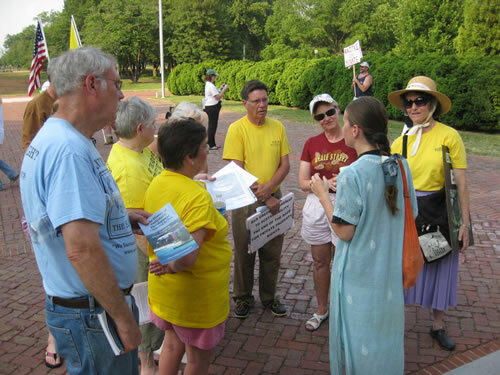 See, the Tea Party is like France in her "protection" of her original language and cee-veel-eez-zation. Language, community, and civilization are organic. They are all ever-changing, influenced, affected by l'argot (that means"slang" for y'all non-frenchie people, y'all...), inventions, new people... I do think we should always mind and reference the Founding Fathers because I do think they got the gist right but... imagine if you transported them here, today... would they really be like France? Entombed in maintaining original culture/outlook? Or would they say, "Cool, yo, I get it, let's move forward and discuss the world situation more my bruthas and sistahs...and put on some bluegrass while yer at it." 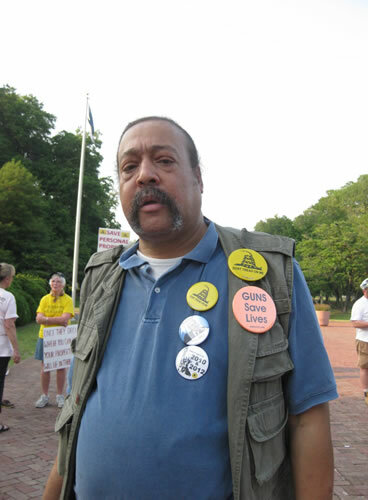 The Tea Party protects "the right to profit." Now I'm all about profit. But if we profit over every piece of land then... what will we have than cement? Whatever happened to being a steward? Isn't it time we look at land and nature as something we depend upon, for our existence, to treat carefully, even with reverence, as a resource we could ruin? I considered that as I toiled over two days seeding the newly-exposed top soil (oh so precious! Please don't blow or wash away! Our family depends upon you!) from the excavating and then spread hay over it again, to hopefully protect it. Oh. Wait. 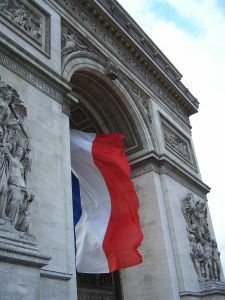 Enough about the Tea Party being all French and all. 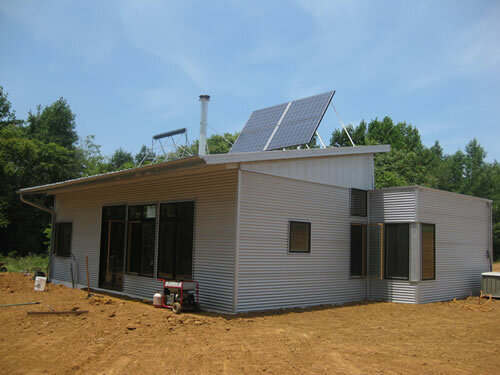 Let's talk about the off grid zero energy prefab house kit! I sowed acres of graded soil with seed and moldy hay in silver Melissa flip flops and a vintage Hawaaian dress. Next time? I'll bring my overalls. 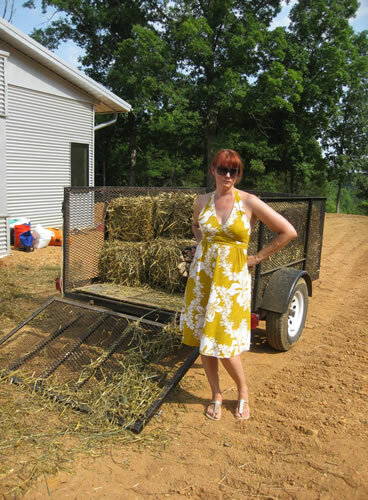 We couldn't find any straw locally, but Mrs. E, our Amish neighbor, did have hay, which had rained on it and was therefore no longer appropriate for their horses, to offer as straw for our newly-seeded home site / area. We were happy to purchase it, a great exchange between neighbors- they got money for not-great-rained-upon-now-moldy hay, which we used as straw and had the added bonus of seeds included that might sprout on top of what we seeded. Clouds gathered, and we got busy. Then: there was one moment where the wind *swept* down, and in a deliberate breath overturned and blew away an entire area I had just sowed. My jaw dropped, then my cheeks flushed high, in shocked indignation at the now-bare soil: as if a suitor had roughly just flipped up the starched petticoat of a until-that-second encouraging beloved. When lightening flashed we came in. 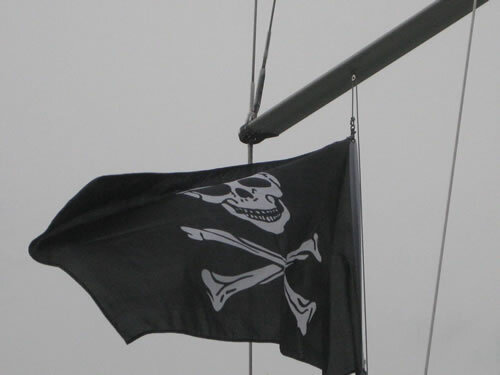 Immediately it began to pelt a steady rain, and thunder rolled across, heavy. So I sit here, waiting for it to pass, with straw in places you've never seen a girl sport in a sunny, vintage Hawaiian dress... I have moldy hay up my nose and down my lungs, ugh. Nice. I'm now covered with mold from shaking the hay out. I now understand what Black Lung feels like. Handsome Husband is thrilled with all the cool plumbing stuff he's learned from Max today. I... I just need a bath. We Cool... Cooling In The Zero Off Grid Prefab And... A Tea Party At Richmond's Sustainability Forum! In the end, it's all good. We cool. Stay cool. 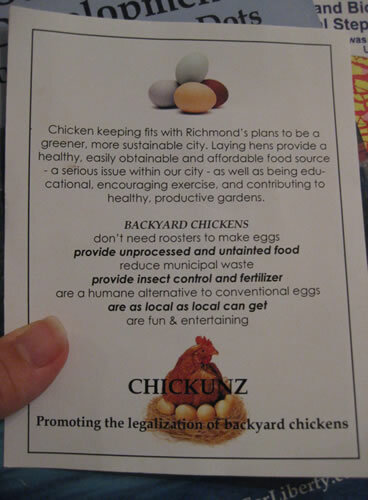 ‎CHICKUNZ and Richmond Green Drinks were out in force at Richmond's Sustainability Forum tonight! Thanks to the Tea Party-er who handed me back one of our CHICKUNZ fliers, I was actually able to put that last lone flier directly into the hands of Mayor Jones! I arrived at The Carillon to picketing, shouting, and placards. Others hurried past, quickly inside, to avoid The Rowdy Tea Party-ers. 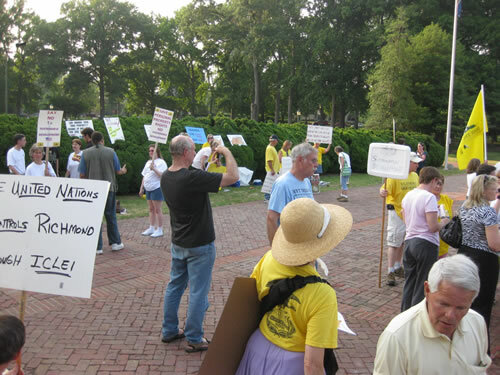 To be fair, the Tea Party was more of a swarm of Anti- U.N. Arguments and... One Loud Rowdy Dude. Shimmering in blue, this lovely, calm woman descended the steps on her own initiative (which no one else inside did) to engage the shouting and began a dialogue, for which I stood behind her to join. (i.e. Watched. Her. Back. in the sign-carrying, chanting crowd.) Already seeing many of my Green Drinks and Chickunz colleagues inside, I thought my efforts were better placed to stand here. 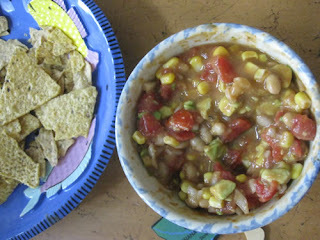 Honeychiles, I'd like to sound gallant, but she did *not* need any help. When voices became raised, we *all* brought it back to civil. It was only after awhile this girl in blue and I turned and saw each other's faces- "Copeland Casati." "Oh, my, gooooosh... it's been a long time. Christina!" Christina Borland is back, Richmond. We are better for it. People calmed down, and Christina and the Tea Party started a nice discussion where people could listen, agree, disagree, and acknowledge that a lot of the things one group was talking about were not in the knowledge or expertise of the other but that they were certainly things for all of us to explore. With lowered voices and a sense of humor, we discovered we had more in common than we thought. 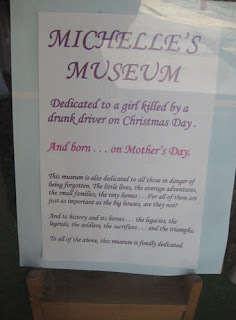 Or, at least, could civilly discuss why we were there. Now I haven't read any of this, but I'm putting out there the web sites in the Tea Party pamphlets to go and explore later, because they did have some good points about their concern over larger entities on the individual. 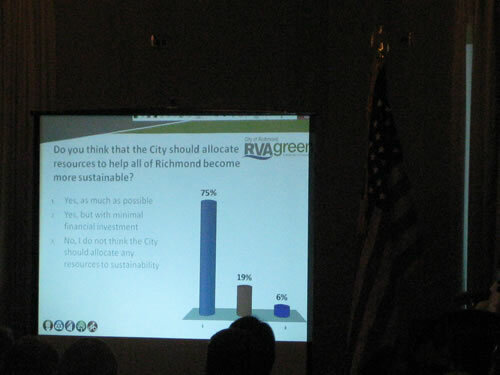 We explained that this "Sustainability Forum" was a casual *forum*, not a Government Initiative For You To Be Packed Into High Density Apartments Even If You Didn't Want To or about The Government Wants Your Property; instead, it was an opportunity for all Richmonders to give feedback on areas to explore in our community where we can increase livability. I get their arguments Regarding Big Government: sometimes I suspect I am being taxed multiple times on my same hard-earned dollar. I am all about paying my way into the community pot, but when I get taxed on my earning that dollar, then taxed on spending that dollar, then taxed on giving that same dollar (which is worth how many cents now?)... I do start to feel suspicious, ha. And here's something I've been turning over in my head: Why Is It OK that our government does not ask me how many prefab house kits I sell (I just report my income to them, not the number of products that earned it, like pretty much every other business model: they don't ask you how many widgets or chocolates you make a year, they ask you how much money you earned off of those widgets and chocolates, no?) yet my farming friends have to send in a tally of their livestock and produce and their stock's location to the government?!? I don't think that the number o' steers or the heads o' lettuce on their farm should be anyone's durned business. Why is their business different and why does anyone have a "right" to that information? I believe in property rights - I want chickens in my back yard and think everyone should have that food right. My neighbors want to nuke their lawn with chemicals regularly next to my food plot and waste our municipal drinking water on hot afternoons to "water" their "plants." How do we decide which is a "right" for our community without civil discussion? "My (ex) family farm is in a town of population 40. Now what happens when the road falls apart? You know most of that population 40 can't contribute, they're just eking by, and even those that can contribute could never raise the thousands of dollars to repave their road to bring access and services to their community. Larger cooperation and services, paid by through taxes, *are* needed. What about emergency response? A town of population 40 can not staff, even as volunteers, emergency services much less afford to buy firetrucks, ambulances... "
"Oh, we're not against that..."
"Well where do you draw the line? I'd also like my laws to protect me from my urban neighbor that's spreading seriously toxic chemicals on the property next door that wafts over to my children's bare feet and our family food plot! Why is that legal? Yet we can't have a few hens?!? 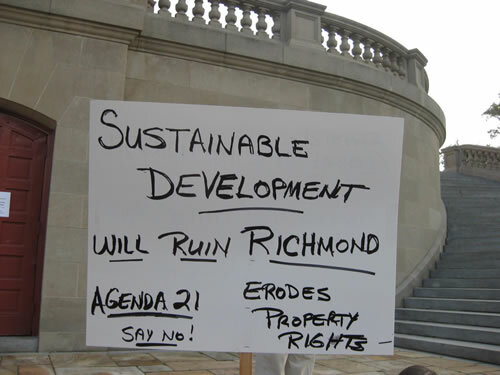 In regards to their property I would prefer they not nuke it next to mine, as it does affect us!" 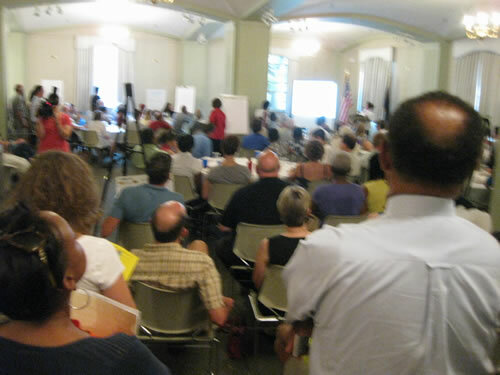 There is nothing nefarious going on inside, folks: City officials created a simple dialog with tonight's forum, where, handing out clickers similar to tv remote controls, one could click on buttons to select your answer to their multiple-choice questions, then, a few seconds later, see what the room voted. It was an opportunity for citizens to provide feedback for some general, very general questions... as a starting point to discuss options with the community they might want to pursue, like, 'Would we like more bike lanes?' and 'Would you use more public transportation.' "
In the end we all had a good time together. But that was the thing- sometimes when you just picket and shout, you don't have an opportunity for dialog and discovering that each other is not crazy. Or, you still think you're both crazy but can remain friends and part of your shared community, with dialog and dignity. Despite differences and commonalities, these people care. And took the time to show up and say something. 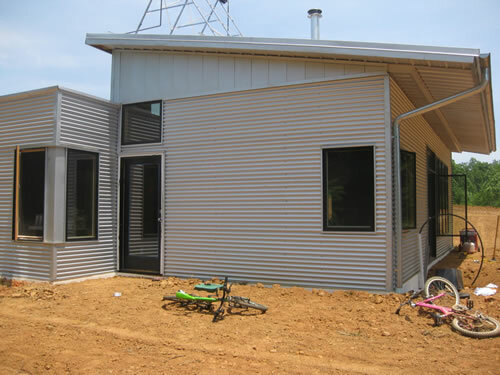 And speaking of COOLING, let's talk about cooling an off grid zero energy prefab house with no air conditioning in this heat! 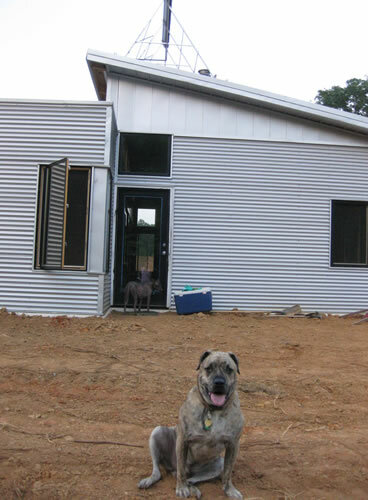 Aside from our prefab house kit's extreme energy efficiency with SIP and passive solar design, we are also building a natural pool to provide a bit of respite on those extremely lengthy dog days o' summer. Here's an example of How To Build A Natural Pool. We've created the basin, now to shovel the plant ledge and to address the lining. Because our soil is sandy, I'm going with an EPDM liner vs. a clay finish. "If you choose a liner, select one made of ethylene propylene diene monomer rather than PVC. EPDM is a synthetic rubber twice as expensive as PVC, but it's worth the extra cost. 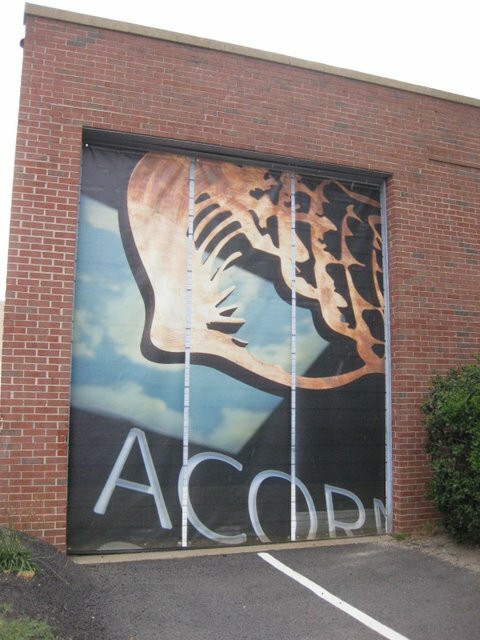 It has protection from ultraviolet rays, and unlike PVC remains flexible in cold weather. If your soil has a lot of rocks or roots, select a 45- or 60-millimeter liner. You can use a 30-millimeter liner if your soil is very sandy and smooth, and if you and your guests aren't likely to tear holes in a liner while frolicking in the pool. Before laying your liner, compact the sod and cover it with a layer of sand or an absorbent material such as old carpeting or newspaper. Newspaper is a good option: When wet, it bonds to the liner, providing extra protection if the liner develops a small hole. 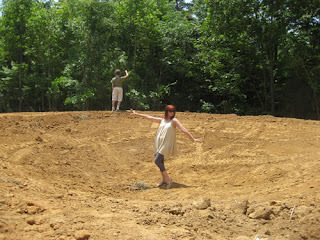 After the bentonite clay or a liner is installed, cover the bottom of the pool with 4 to 5 inches of gravel. The gravel provides a habitat for beneficial bacteria, which help biodegrade leaves or other natural materials that sink to the bottom of your pool. Make sure you use clean gravel. Fill a 5-gallon bucket with a spigot with some of the gravel you intend to use. Open the spigot and run water through the gravel. If the water comes out dirty, you need to clean the gravel (a taxing, water-wasteful process) or find another source. Expanded shell aggregates and other manufactured gravels are likely to be clean enough to use in your natural pool. In addition to lining the pool with gravel, many people opt to build cobblestone steps for access into and out of the pool. A cantilevered dock built out over the water also provides an easy way to get in and out of the pool, and helps protect the pool's sides." I then called to eagerly place an order for the liner and was educated on how much of a pain it is to get a gi-normous pond liner to the land. Fact: Did you know a 45' x 45' liner is over six HUNDRED pounds in weight and arrives on an EIGHTEEN WHEELER? And that they recommend four people to help unload it. I am going down a mental list of who's who of our friends and which ones own pick up trucks and want to visit us. 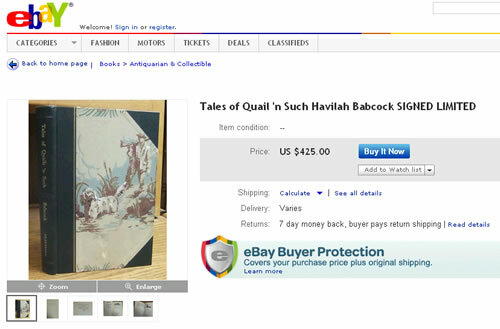 So before you attempt an "easy" project like this, get quotes on *everything,* honeychiles, everything, not just the excavating. 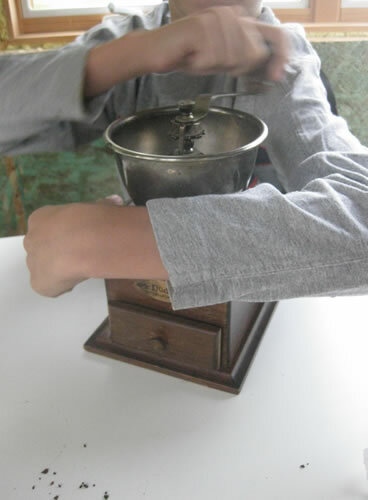 Recommended reading: Although you all know I am in love with my antique cook stove that we sealed up to make it more energy efficient and safe for use in a SIP house, I encourage you to read Lloyd Alter's article on whether wood heat is green or efficient. I did not expect it, but upon arrival to the zero energy, off grid prefab home, WOW what a DIFFERENCE the grading around the prefab home makes!!! No longer does the slab show; it's now tucked snugly away, already increasing our energy efficiency with insulation underneath, around, but now: topped with earth! Instead of hills off to the side, we now have a gently sloping area, easy to maintain and mow without concern the tractor will tip. But the most noticeable difference is we no longer need to step UP into the house- the landscape is now level to welcome you out for your next adventure on the land!!!! This is a *lot* deeper / bigger than it looks! 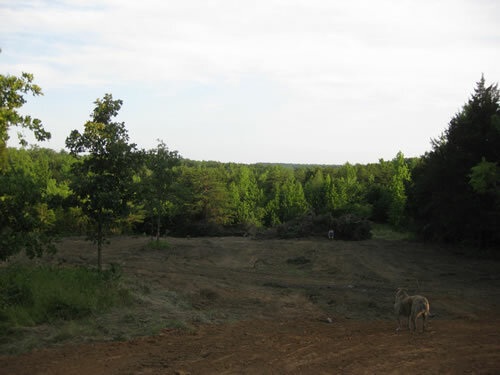 Look at that Future Natural Pool! I tell ya, it IS hard standing around in this heat staring yearningly at that dry, barren basin. But my imagination gives me hope: I picture lush reeds, cool respite, even a bit of shade somehow (I have been thinking of some creative approaches to that, by the way, that don't involve leaves...). 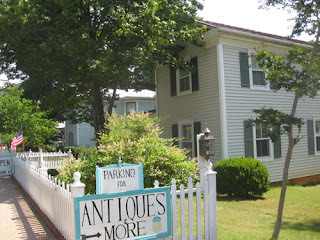 Saturday morning we headed into Appomattox for riding lessons and to celebrate the antique store B & L's twelfth anniversary in business! Let's switch gears to briefly discuss urban planning and tourism. 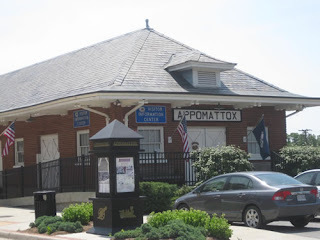 Appomattox. Please do not move that visitor's center. 1. It is a friendly, historic, welcoming building - a train depot! Charming! And it's already paid for! 2. It is in the midst of your retailers and restaurants! Are you kidding me? 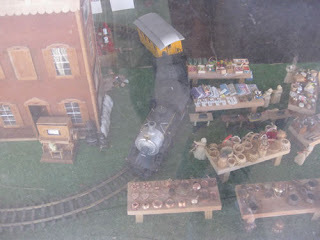 Picture it: Tourists arrive to the Visitor Center because they want to orient themselves and discover what to do next. They've just driven awhile, and just want to relax and stretch their legs. 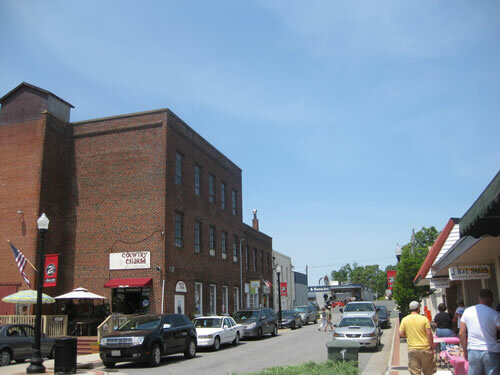 Thankfully, Main Street welcomes them with plenty of parking, and interesting things to explore while they revive their weary legs. Don't greet them on the highway (Ew, cold & desperate, honeychiles, cold and desperate). This is not South of The Border, this is Where Our Nation Reunited! Don't set upon them on the interstate, instead, gently happily lead 'em straight into the true, warm, welcoming heart o' Appomattox! Picture: They enter the Visitor's Center, peruse the walls of pamphlets, use the restrooms... Now what? Here's what: They want to sit & read over their options. I mean, they don't know what's going on this weekend aside from the one Destination Event they came here for, right? How do they discover everything else?!? Ahhhhh look at those lovely sidewalk benches! Just the thing! Let's sit down in the shade and ponder this stuff. Herb: "Waaaaait, Myrtle! Did ya see this place Baines Books & Coffee has MANDOLINS?!? 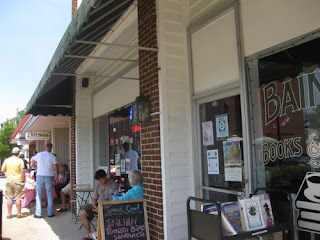 And aisles and aisles of books on history and best sellers and classics and anything you want to read?!? And they have an OLD TIME BAND playing tonight, and some darned good scones!!!! 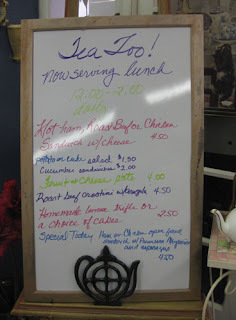 Did you see the flyer at their counter?!? It says there's also a band playing in the park Friday!" 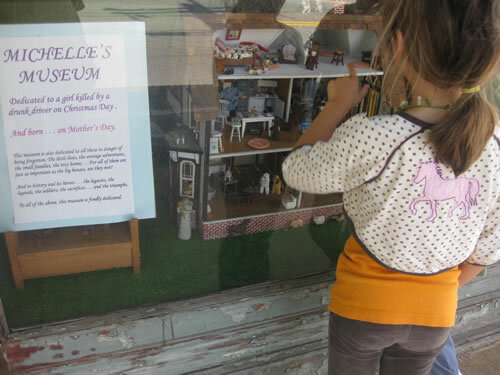 Myrtle and Herb spend three or four hours shopping, taking a walking tour of all the historic homes, snapping pictures, and creating memories as they spend dollars on and around Main Street. Now it's time to check in to their bed & breakfast. They've put their drive behind them, and are already relaxed! Tomorrow? They'll have a great breakfast before trundling happily off to the other end of town, to check out the new branch of the Museum of The Confederacy of which they'd read so much! Which, providing the counterpoint and balance to retail, leads as a gateway to their next stops for another great day: battlefields at Appomattox Court House, camping, Blue & Brew festivals at the 4-H, delightful respite and swimming at Holliday Lake, hiking, the many lovely discoveries as they venture further out before returning home. Please don't move the Visitor Center. Moving the Visitor Center is a bad, bad urban planning idea. I discovered two things today I did not know along this street I thought I knew so well. I don't smell restaurant smells...? Ooooh. I adore cucumber sandwiches! 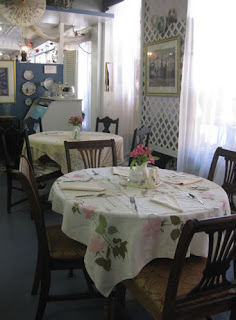 Charming tables draped in vintage linens, pretty crockery, all just waiting, ready, quietly for Ladies To Lunch to arrive. The tea room is open... seven days a week, from twelve to two. As an outsider I had to stumble on it several times to discover it, she, who, all along, was ready and waiting for us. 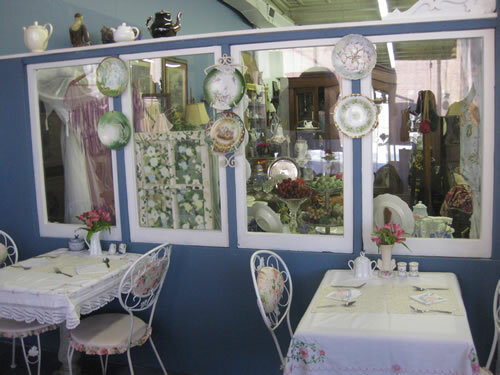 Make sure you also wander down to Antiques & More, just a half block further. She has a house full o' old finds, a beautiful smile, and doesn't want the Visitor Center to move, either. While I'm on a tangent, dreamily picturing myself as Mayor For Life of Appomattox, (That's 'Supreme Dictator Empress Yes Ma'am' to you...) let's discuss the new farmers market. 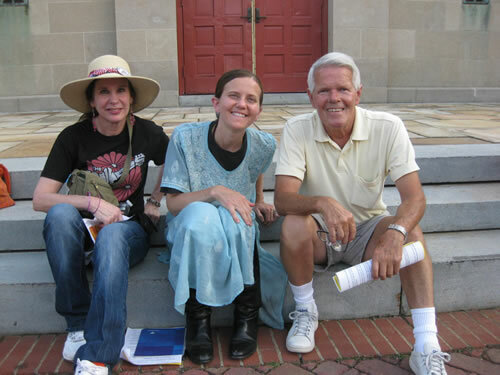 Now, I know something about farmers markets, having many of my friends here (Aults Family Farm, Frog Bottom Farm, Eli's Greens, Fertile Crescent Farm...) being well known & beloved farmers in our Richmond markets & CSAs... but I also helped (and still do) Lisa Dearden start up one of the biggest farmers markets in Virginia, with over 47 farmers / vendors, My Manakin Market, this spring. So. Appomattox. Back to yooooou. Taaaaa-daaaaaa! 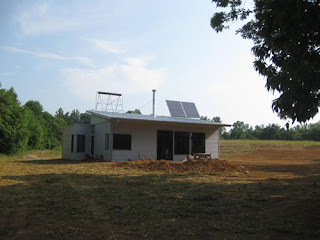 Ok now let's move on, and back to the off grid prefab house kit construction. We also did, thanks to Justin Layne, quite a bit o' Bulldoze-Tree-Release this weekend. What. You've never heard o' Bulldoze-Tree-Release?!? Well, take the philosophy of Crop Tree Release, and add a bulldozer. and an orchard will be born. I'm Officially calling this next part of the post, A Very Bad Idea. Which the childrenz enthusiastically refer to as, "Snorkeling In The Cistern!" Which takes Dumpster Diving to a whole new level. The guys dropped two pipes into the cistern, plus needed the pump placed. The pipes must be retrieved, so Child Labor was Conscripted, who happily squeaked their enthusiasm. Do not try this at home, we opened all the ports for air & light, and disclaimer, disclaimer, disclaimer, yada-yada-yada. "Hey, Momma. Do you want to watch?!?" Do not try this at home, folks. In fact, let's just never do or mention this again. Childrenz: "IT WAS LIKE STAR WARS!!!!!!!!!!! YEAH!!!!!!!!!!!!!" On a quieter note, the birds were calling and calling to each other all weekend. I heard quail, owls, some interesting calls I can't identify, and thankfully, the whippoorwill I have enjoyed for years! But wait! It gets better! This time I SAW HIM!!!! Sadly, YOU can't see him, because was so dark, but there he was on the ground right near the tire swing & wood pile singing his *heart* out. And then, a *BAP! * - something explodes right above him, and I think it was his mistress landing to pay him a visit. Check it out! Ahhhhhhhhhh, summer nears, and with it my House Frau In The House Kit emerges. I began to attack the construction mess and now insist we begin to put this house literally in order. So no more soldering, sawing, and sanding inside guys, y'hear??? 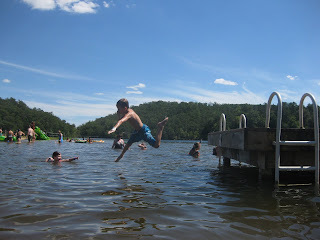 When it heats up in Virginia, that just means you head to water. Just like these guys!